This is a prime lens manufactured by Nikon and the model was launched 2003. Worth thinking about is that the lens has a Fisheye-character which give the images an extreme wide but curved 'barrel' look which may require some post processing in your image editing software. Though, the lens offers you as a photographer the widest of wide angle views.. The possibility to use auto focus (AF) is available for Nikon cameras but only if the camera itself has a built-in auto focus (AF) motor. Some cheaper and budget camera models from Nikon lacks a built-in auto focus motor, and we at Lensora appreciate auto focus, so in the list of compatible cameras we have chosen to display only the cameras that you can get autofocus with. The lens has a focal length of 10 mm. 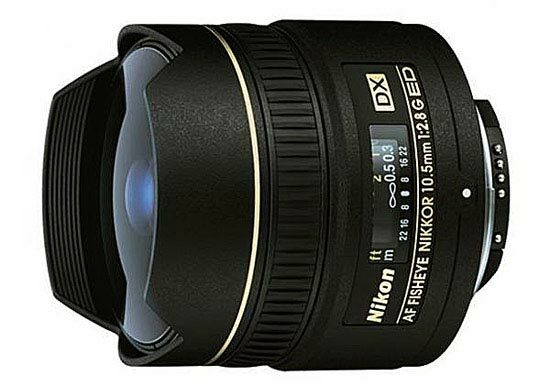 Since the lens is designed to be used on a camera with smaller sensor ('APS-C') the focal length will be equivalent to 15 mm on your Nikon camera. This lens does not support the use of filters which is slightly negative. To have the option to use filters, for their optic purpose or as protection, would have been nice but no. Most lenses have the lens hood as an accessory, something that you mount on the lens seperately, but this lens has a lens hood as a fixed part of the lens. Text from Nikon: "This ultra-wide-angle, frame-filling fisheye, designed exclusively for use with Nikon’s DX-format, delivers incredible images with a 180-degree angle of view.